Bugs Bunny as a Southern belle. On this day in 1937, Margaret Mitchell won the Pulitzer Prize in fiction for Gone With The Wind. Below is one of my favorite photos from the book Scarlett, Rhett, and a Cast of Thousands by Roland Flamini. 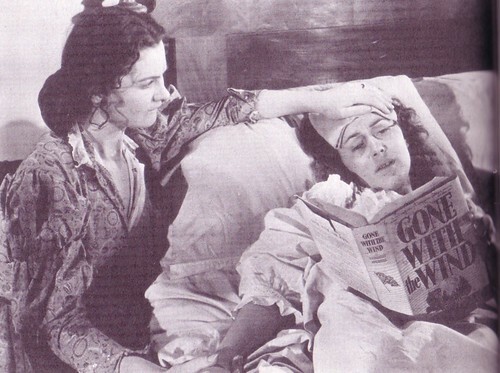 While filming the delivery of Melanie's baby, Vivien Leigh and Olivia de Havilland posed for this photograph and sent it to Margaret Mitchell. Her husband, John Marsh, wrote back saying Olivia de Havilland looked exactly like Margaret Mitchell when she was writing the novel.